Hi, I know there have been other threads here talking about this on the side, but I think it needs some specific attention. We're SO close to making Cintanotes run on Linux throuh Wine. I downloaded the latest CintaNotes installer, and ran it on my Lubuntu OS through Wine Windows Program Loader. The installation proceeded perfectly. It even created start menu group and a shortcut on the Desktop, and its icon came in the taskbar. All of this on a Linux OS! 1. Import XML : imported all my notes that I'd exported from Cintanotes in my Windows machine. 3. Search, all kinds of search. Search-as-you-type. Tags show up as you type them. 6. Recycle Bin : all functions incl Restore, with the due popups. 7. Right-click on a note and copy content gets copied to clipboard; I can paste it anywhere. 9. Right-click > Properties : loads the properties popup, I can edit the date-time stamps and save the change. 9. 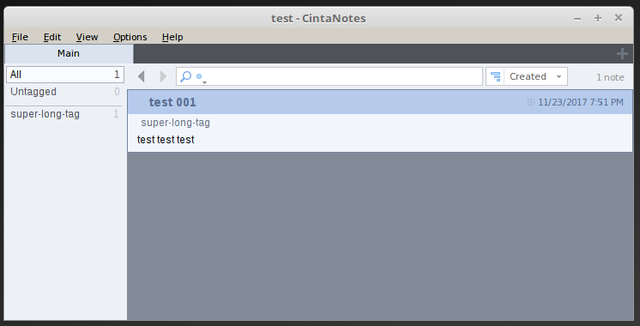 Right-click > Tag : add tags, remove tags to and from notes. 11. Clicking on the note, press Left or Right keys to scroll the excerpt up or down. There are only 3 things that are not working on CintaNotes loaded on Wine/Linux. So please, guys, let's crack this cookie! CintaNotes is ALMOST working on Linux (over Wine)! it seems that Wine doesn't implement certain COM methods of the ITextDocument interface which CintaNotes relies on. Some of the functionality is available only through COM interfaces of RichEdit. I'm not sure we'll be able to get by without these methods. RichEdit is tricky and I'll rather avoid having to reimplement this code. Also I have no idea how to debug a Windows app under Wine. However I promise to return to this if we decide to move away from Richedit to another rich text editing component. Make a plaintext version of CintaNotes. All the other functionalities are working because they're using plaintext and not richtext, as per my observations. it is also links which everyone needs. So we'll have to put it off till we migrate from RichEdit. Yep, Linux support is a sore point, unfortunately! I made editing work by providing wine with original windows dlls: riched20.dll and riched32.dll. See attached screenshots (right-click -> view image to enlarge). This is quite amazing and I can use CintaNotes now. I also set it to show terminal so I could watch any errors. Haven't tested much but the basics are working fine. Let me know if you need any details. Alex, if you get interested in reaching Linux users, I think the first and cheapest step would be to make CN work with latest wine. Some ideas: prefer APIs that are available in wine, create an wine-compatible distribution, try to bundle RichEdit control with CN (is it legal?). Wow Burrum, that's amazing job! About bundling RichEdit control: AFAIK this is not legal. I've now googled it and couldn't find any reliable info on this matter. Edit: I'm using this for half a year now. Except the paste bug it's quite satisfying. Burrum, huge thanks for taking the time for documenting the whole setup! I'll add a link to this thread to the Goodies topic..
That's super helpful. Thanks Burrum! Alex, there is one more problem with CN under WINE. Could you please do something about it? It's the last thing that prevents me from using CN under linux.